Preheat oven to 450 degrees, with oven rack at second-lowest position. In a large heavy Ziploc plastic bag, combine bread crumbs, cornflakes, seasoning salt, lemon pepper, pepper and garlic powder; shake the bag to mix. In a shallow bowl slightly beat the eggs. Adding one piece of fish at a time to the bag, coat well with the mixture, then remove and dip the fish in the eggs, then return to the bag to coat the fish again, repeat for all of the cod pieces; transfer to a plate. Heat about 3 tablespoons of oil in a large 12-inch ovenproof skillet (preferably cast iron) over high heat until hot but not smoking. 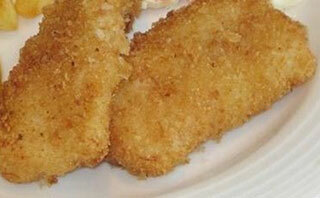 Fry the fish until the undersides are golden brown (about 1 minute). Turn over and add in another 3-4 tablespoons of oil; cook another 1 minute more. Place the skillet in the oven and bake for about 5-6 minutes or until JUST cooked through.